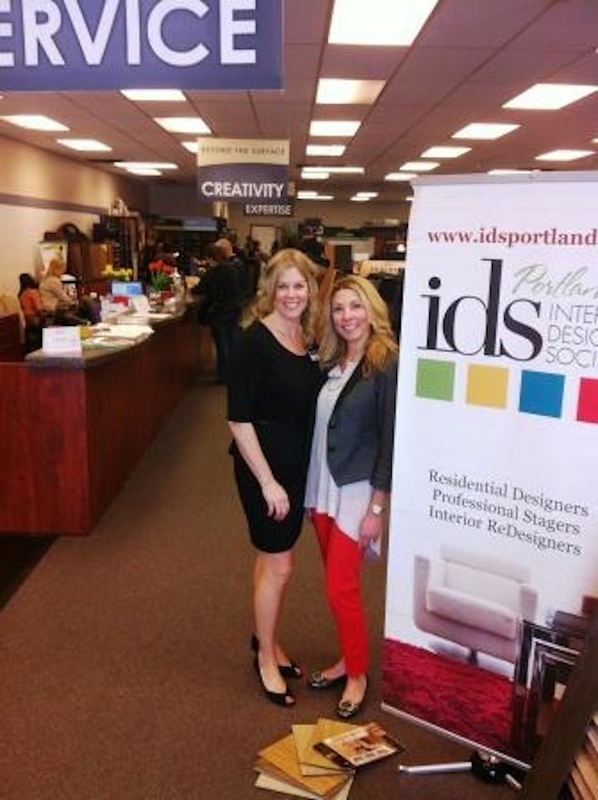 The Portland Chapter of the International Interior Design Society celebrated their 4th annual Color Event with a lunch and presentation by Gretchen Schauffler, Artist & Founder of Devine Color and a nationally recognized speaker. The event was hosted by Area Floors owner and long-time IDS member Brandy Marsh, at her showroom located in Tigard, Oregon. Gretchen began her presentation with a review of the last few colors nominated by Pantone for Color of the Year and how they were selected based on current trends of the times. According to Gretchen the color choice itself is a “fad reworked from something that has been here since eternity”. She pointed out that the same 6 colors of the rainbow we see today have been with us since the beginning of time and it is these same 6 colors that are reworked each year based on economic, political and environmental events and the effects these events have on society. Knowing the difference between a trend and a fad helps to substantiate the idea that color itself is trend-proof. As explained by Ms. Schauffler fads come and go while trends slowly move us into change. Using Pantone’s 2013 Color of the year as an example, emerald is the fad and the trend is bold color. It is the growing confidence of women that is allowing the bold colors to continue as a trend. This boldness can now be seen in more than just color, it is seen in patterns, fabrics, all kinds of materials including carpets and other flooring. Some of the other examples she highlighted of colors,based on trends included Blue Iris, the 2008 color of the year chosen for reassurance in such a year of major changes. The following year 2009, Mimosa as first seen on Reese Witherspoon, was the color of choice and showcased the feeling that ”optimism is paramount”. She went on to discuss other trend proof colors such as white and the purposeful use of white as paired with color, not the absence of color. Although the annual color choice is selected based on social trends, the popularity of a color and the enthusiasm with which its received is still based on personal experience. As an example, Gretchen shared the special meaning Emerald Green held for her. She also shared her experience with red and asked the audience to consider the impact of certain colors on their choices throughout life. Gretchen expressed her belief that “This personal experience with color allows the buyer to connect on an individual level”. Gretchen concluded her presentation with a philosophical look at where we are going based on the popularity of current and upcoming movies. Citing Beast of the Southern Wild, Moonrise Kingdom, and others she see’s us heading towards a period of deep meaning and understanding. The remaking of The Great Gatsby and other upcoming movies will lend a maternal quality to this period of self-expression and strong femininity which will drive our design styles and color choices. This feminine strength will be coupled with the need for re-purposing and recycling. This nostalgia for what we have will play out in different ways, including pennies showing up in flooring materials and floors made of old leather belts. Looking past the immediate future Gretchen sees these current trends meeting digital technology such as the Google Project Glass. Coming to a close she reminded us that nothing under the sun is new, rather everything we find is rediscovered and reworked by artists, designers, poets, visionaries, geeks and musicians thriving through the colors. Finally, she concluded by opening the floor up to attendees to voice their thoughts on next years color of the year. Gretchen closed with her vote for Violet as Pantone’s 2014 Color of the Year. Following the presentations there were door prizes provided by Area Floors, and some of the other vendors in attendance including Mark Fishback from Dal Tile, Molly Murphy from Pental, and the Kentwood local distributor Dave Scherrod of Metropolitan Flooring.